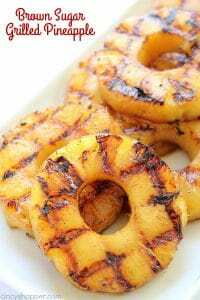 This super easy Brown Sugar Grilled Pineapple will make for a perfect side dish or even a dessert this summer. 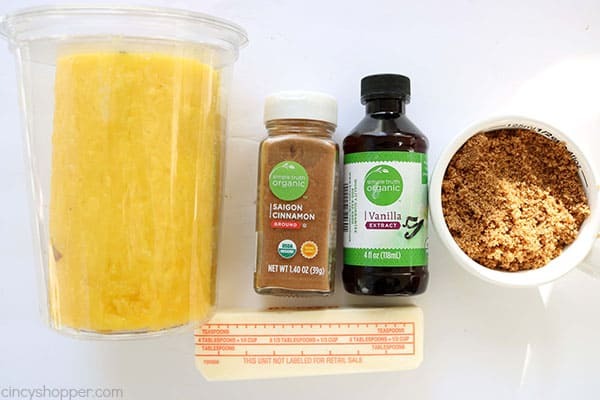 With just a couple simple ingredients like butter, vanilla, brown sugar, and cinnamon, you can whip it up and toss it on the grill in no time at all! Grilling season has arrived! Our grill that we have had for years was on its last leg, lol. So… hubby bought us a new fancy grill. I was a bit reluctant about him spending so much on a new one but we grill so much during the warm months so I know it was a great investment. The two of us have been grilling some of our favorites and also some new grill recipes that I am anxious to share with all of you. Earlier in the week, I shared our Cilantro Lime Grilled Chicken. It makes for a perfect main dish. We always seem to just make our meat on the grill and forget that there are so many different side dish options that can be cooked on it too. I was making another great chicken dish that I plan to share with you later in the week. 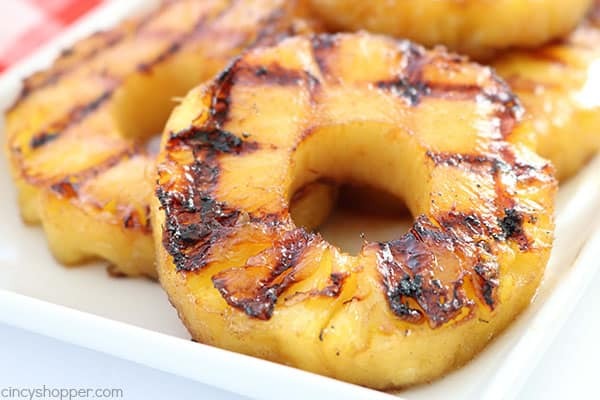 I needed a side dish that would complement it and decided to make our Brown Sugar Grilled Pineapple. I have made these so many times in the past but I normally make it indoors on our grill pan. During the warm months, I like to enjoy simple side dishes that are not overly heavy. 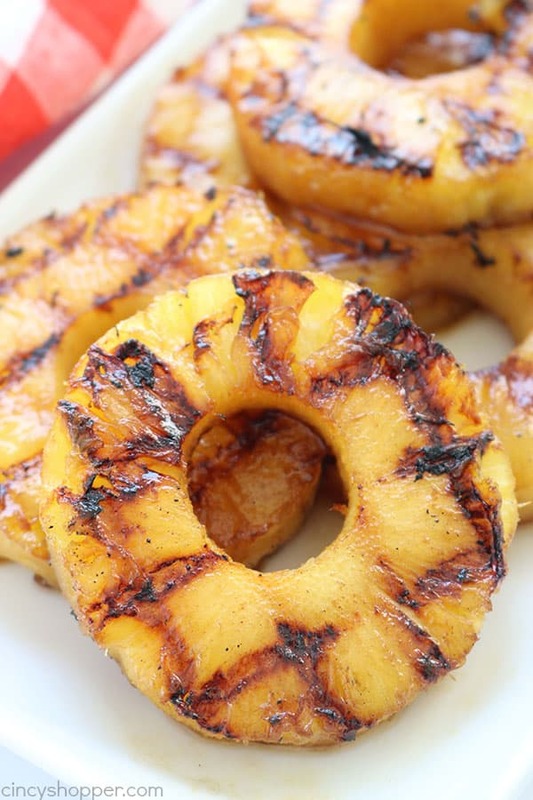 This pineapple compliments chicken dishes so well. It is sweet and when you pair it with a savory chicken, it is perfect for summer. 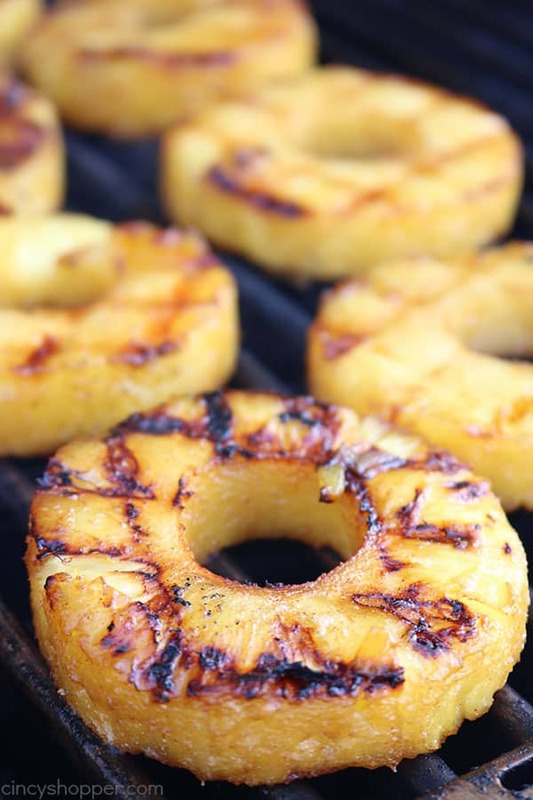 Great for side dish for your next BBQ. You will be making it again and again! 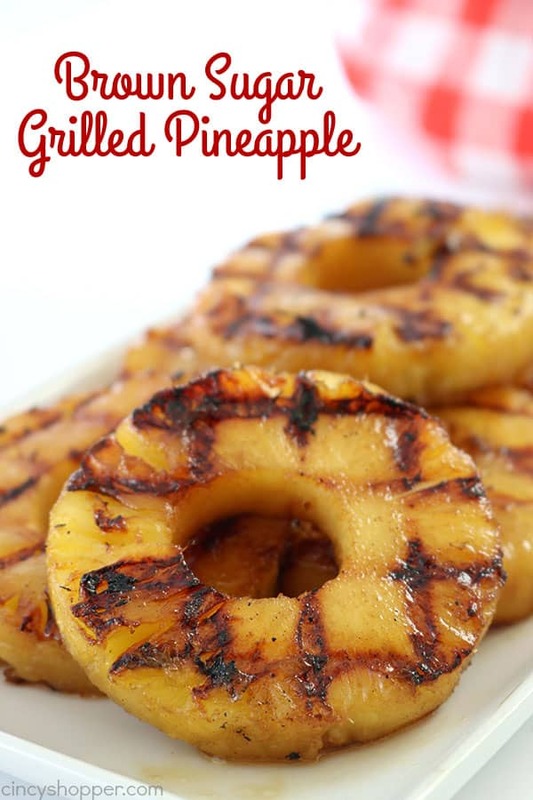 If you are a fan of pineapple upside down cakes and desserts… you will love this grilled pineapple for a dessert too. 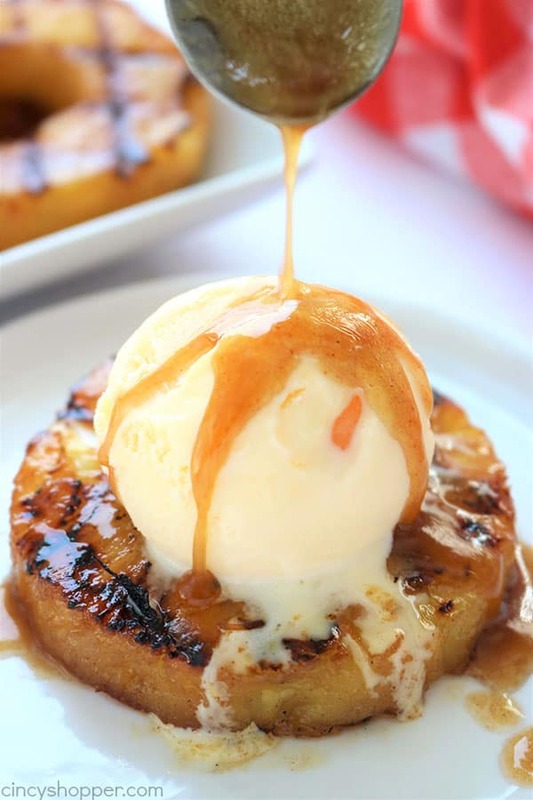 I tossed on a small scoop of ice cream and drizzled some of the brown sugar mixture on top. Oh my… it was delicious. 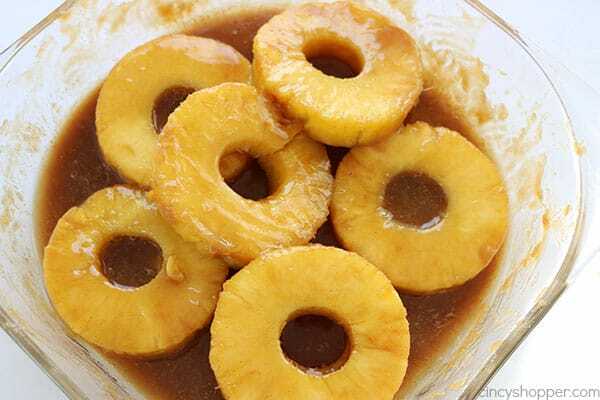 The cinnamon, vanilla, sugar, and butter are sweet and perfect with pineapple. 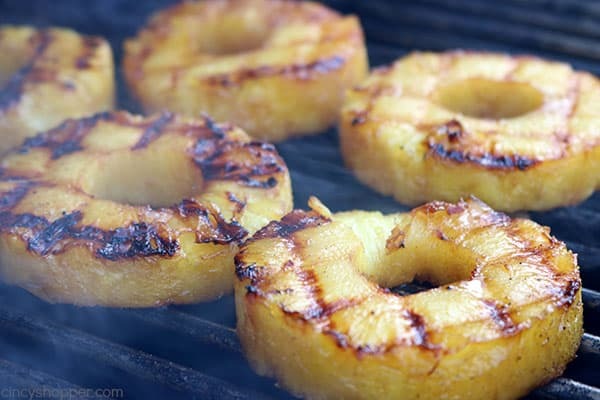 When you coat your pineapple and then grill it, the brown sugar and cinnamon caramelizes and makes perfect grill marks. just be sure to get your grill really really hot. Just a few simple ingredients are needed to make this recipe. 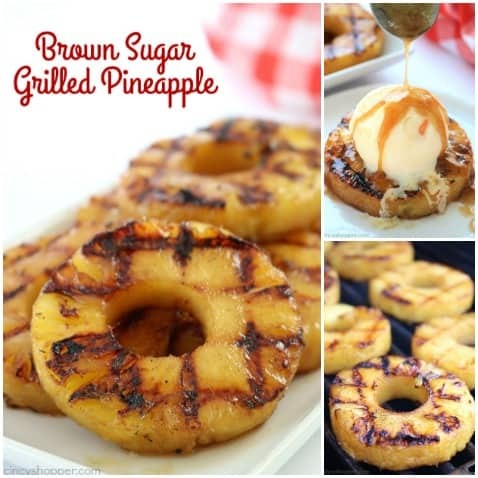 You will need some butter, vanilla, brown sugar, cinnamon, and of course a pineapple. I took the lazy approach and purchased a pineapple that was already all set for me to slice. You can usually find them in your fruit section at your grocery. Lather your mixture generously. If you find the mixture is thickening and binding up…. place it in the microwave for about 1 minute and re whisk. 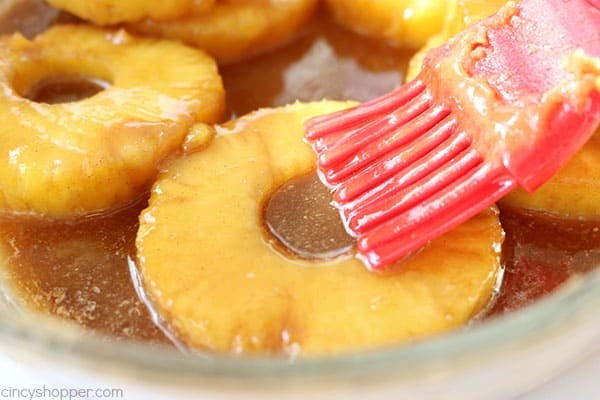 You will want to do that step too if you plan to drizzle your pineapple after cooking. 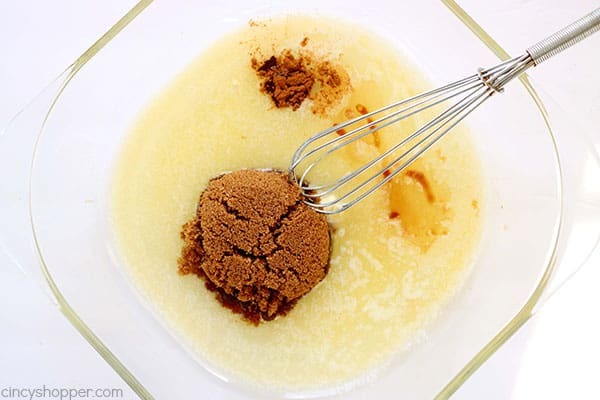 Combine butter, brown sugar, cinnamon and vanilla. Place pineapple slices in mixture and set aside. Heat grill on high until max temperature is reached. Place slices on grill for about 2 minutes, until grill marks form. Rotate each slice 90 degrees and allow to cook 2 more minutes. At this point you should have hatched grill marks on bottom. Brush each slice with more mixture and turn over. Allow slices to cook for about 2 minutes, until grill marks form. 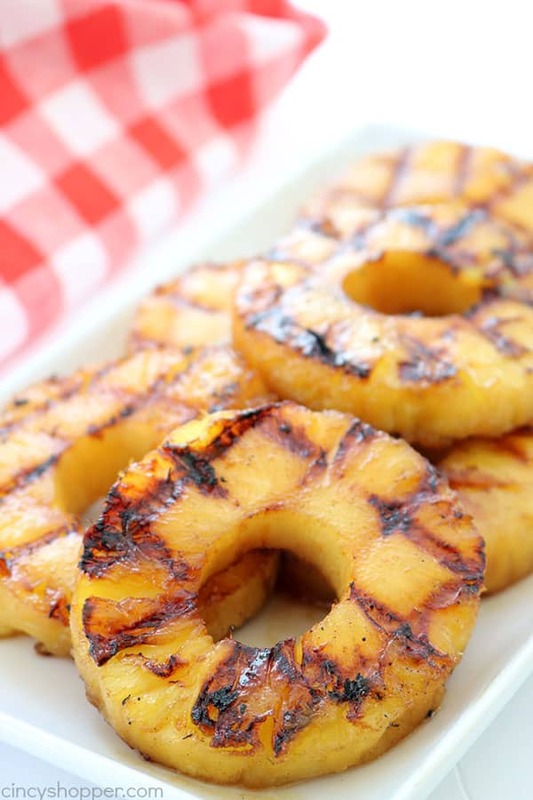 Have you ever grilled fruit on your grill? Combine butter, brown sugar, cinnamon and vanilla. Stir until blended. 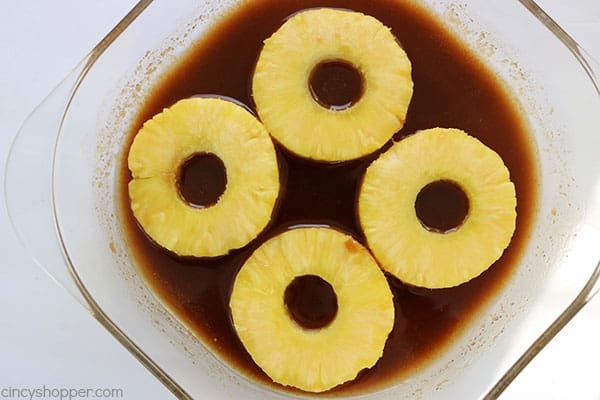 Place pineapple slices in mixture and set aside. Heat grill on high until max temperature is reached. Place slices on grill for about 2 minutes, until grill marks form. Rotate each slice 90 degrees and allow to cook 2 more minutes. At this point you should have hatched grill marks on bottom. Brush each slice with more mixture and turn over. Allow slices to cook for about 2 minutes, until grill marks form. Rotate each slice 90 degrees and allow to cook 2 more minutes. Remove from grill.